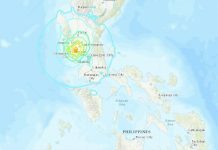 Two strong M6.0 earthquakes hit Alaska and Papua New Guinea within 4 hours on July 19, 2018. 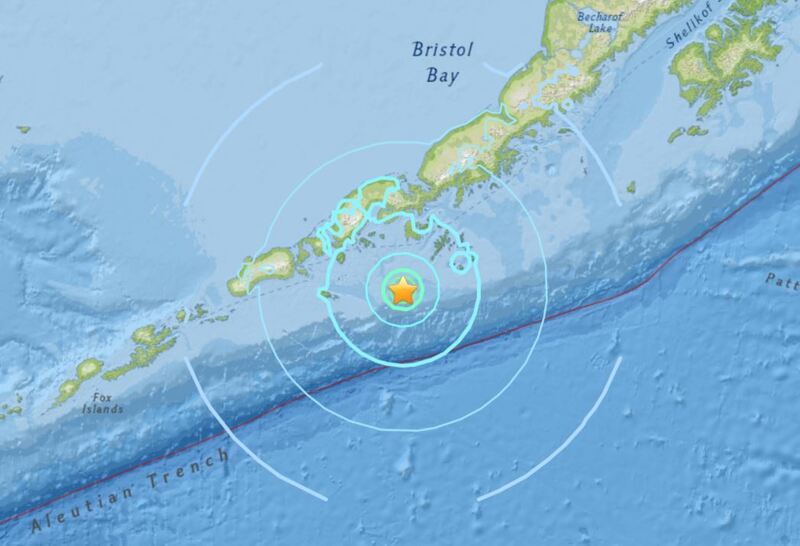 The first of the two struck 92km WSW of Chernabura Island in Alaska at 14:16 UTC on July 19, 2018 and at a depth of 17.1 km (10.6 miles). 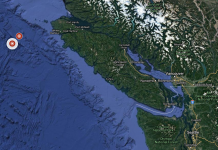 There are about 400 people living within 100 km (62 miles). A tsunami was not produced. This earthquake is expected to have a low humanitarian impact based on the magnitude and the affected population and their vulnerability. 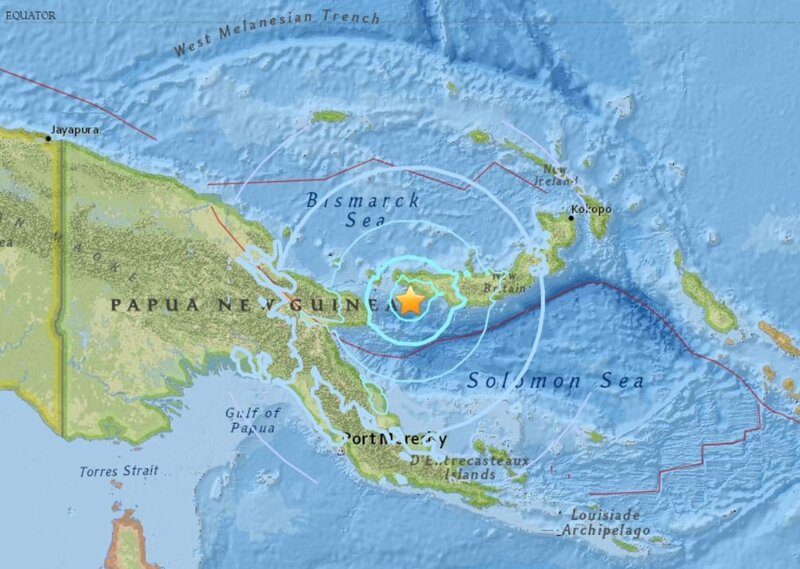 4 hours later, at 18:30 UTC, the second magnitude 6.0 earthquake hit 95km W of Kandrian, Papua New Guinea at a depth of 31.2 km (19.4 miles). Nobody has reported the quake in the area as less than 3000 people live in the region. A tsunami was not produced. But still… Two strong earthquakes with magnitude => M6.0 is pretty rare these days. It is amazing that we have many huge explosions, tornadoes, floods, huge fires, earthquakes, volcano eruptions…. This is the New Normal, and it is getting worse toward the end of the time on the Earth. Today, what happened? A huge tornado ripped the cities of Iowa. Check out the following video. You can see the tornado demolishes Satanic Historic Courthouse. Many satanic ritual building has tower or clock tower. Clock tower represent they manage your time, and time had been created by those reptilian entities in order to use humans as slaves. In upper dimensions, there is no time. Past, present and future co-exist. I’ve found it looks like glowing light orb style UFO just above the courthouse in the exact same time the top of the courthouse was blown away. It appears at 0:09 on the video above. The same toradoes destroyed in Marshall town, Iowa, also destroyed Vermeer Corp in Pella, Iowa. Look at the piled up destroyed cars on the parking lot. Vermeer Corp is just like John Deer, producing agricultural machines. More detail about destruction on Pella, Iowa. Another tragedy in Missouri. A tour boat on Table Rock Lake capsized and sunk, killing 17 people. This lake looks like a snake or a dragon if you look on Google Map. Before I purchased a log cabin in Alabama, I looked many properties around Missouri, too, especially around this lake. Then I’ve found this lake has many cave entrances, but accessible ONLY from boats. Probably those people perished were all human disguised cannibal reptilians just came out of those caves. Sunken duck boat can be operated on water or on land. On water, it can be a boat. On land, it can be a bus. 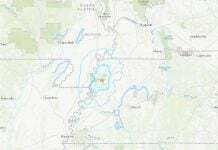 Why they operate duck boats on Table Rock Lake, Missouri? The answer is those duck boats go into the caves of the lake. Remember, those cave entrances are accessible from a boat. But after that they need a vehicle to go deep into those caves. That’s why duck boat is the best transportation for cave dwellers (=human disguised reptilians). There are some interesting points on this video that I want to share with you. In the very beginning of the video, you can see a huge landslide that happened some years ago, in Italy, not in Mongolia. Buses operates in a deep flooded water remind me that the sunken duck boat in Missouri. Starting at 8:17, How many UFO you can find on the scene of the lightning storm in Arizona? You can find at least 3 glowing light orb UFO on the top center of the screen. From 8:23, you can see many orb UFO floating in the sky, then 3 cigar shape? 5 lights UFO coming from upper right to lower left on your screen. If you open Youtube from Google, you can slow down the speed of the video up to 0.25 (4 times slower). The slower, the better to find those UFOs. I’ve found more UFO on this video. At the ending of this video, the scene of the storm of Manhattan New York, you can see a quite good size UFO. Just after you see a beam of light (you might feel flushing light if you do not slow down the video), you will see the UFO flying out of the beside the building. Sorry, this is the tornado video. Reptilians who can create FREE money out of thin air are living gorgeous water front properties in Okanagan. You can see Reptilian shape-shift on the following video. Starting at 1:18, look closely the guy’s face wearing blue T-shirt written “Hollister”. In order to see this shape-shift, you need to make the video 4 times slower (If you access Youtube from Google, you have the function to slow down up to 0.25) with FULL screen. You can see the shape-shift especially when he says “Yeah!”, and turns his face to the camera. This area has military base, Yakima Training Center. You cannot see very much anything on the surface of the land, but they have a huge secret underground base. Here is also close to the huge landslide where called “Rattlesnake Ridge” just beside a quarry (=entrance and construction site of Reptilian secret underground base). Recently, so many discarded (by reptilians or reptilian entities) human skulls and bones, and human bodies were disclosed by Galactic Federation of Light. This exploded factory was producing poisons for your food and body. We should say “Thank you!’ to Galactic Federation of Light for destroying this evil factory. If you leave a frying pan with eggs on this drive way, you can cook eggs. You don’t need a cooking range. There are at least several glowing light orb kind of UFOs just above the volcano. Can you spot them? INSTANT KARMA! for producing chemical weapons to kill people in the world. Reptilian shape-shifters in Australian Defense Force exposes their reptilian hands. Starting at 0:19, look closely at the left hand of old lady. You can compare the hands of the lady next to her. Her hands are too big, and does not look like a human hand. Starting at 0:33, look at the hand on the table! Can you do that? Attention to the position of his thumb, and his hand is flat until his palm. Flash Flood in ? No description with no views. Reptilian religious property was burnt down. A historic building in Mars Hill Bible School in Florence, Alabama was burnt down. “the aftermath of the second fire at the Larimore Home. July 20, 2018 ” This is 2nd fire??? That means this building was used to sacrifice human children for satanic entities (reptilian entities). Bible is used to brain wash and subjugate humans under Reptilian entities telling humans “If you do not follow the rule of churches, you are going to hell!”. Bible has been re-written many times by reptilian entities throughout in order to control humans as their slaves and their food (They are managing us as cattle.) The name “Mars Hill” represent “Reptilians who have come from Mars”. Of course, they had bases on Mars, but they lost Mars after a comet, Siding Spring (actually a mothership from Galactic Federation of Light) exploded Mars and destroyed all their bases in 2015. Fire breaks out near Texas State University. Explosion after car crush in India? It looks like BBQ fire is the reason for this house fire. Look at the whole large balcony is burning. BBQ is the animal sacrifice for Satan. I saw a big flame coming out of BBQ grill of Game Warden living in my neighborhood. In the Old Testament, “God loves the smell of animal (including human children) sacrifice”. Yes, the God you are worshiping is Satan = Cannibal Reptilian Aliens from outer space. I believe these are the locations of Reptilian Secret Underground bases located and connected. Crater Lake National Park is the hottest place for human children abductions by human disguised reptilians in Oregon. Many children and young people are missing every year. Volcanic places are convenient for reptilians to take advantage of natural cave system as their bases or passages. Reptilian victim who lost her father in the great flood in Japan. At 1:24, you can see her left eye ball shape-shift into a vertical line (eye slit). You also can see her eye slit at 1:27~1:28.